These top stocks are led by some of the best minds in business today. Tracking down superior stocks isn't easy. After all, current share prices are supposed to reflect all known information about a stock, making it impossible to beat the market, or at least according to the efficient-market theory. But some stocks do crush the market, and investors are constantly searching for clues into those that do. Several factors can help propel a company to outperformance, such as a well-known brand or competitive advantages existing through scale, network advantages, or supply chains. However, one often overlooked factor is management. Ultimately, the success of companies tends to come down to the strategy and leadership of the people running them. Great leaders often have the ability to see where markets are going in ways that others can't, and predicting the future in such a way can give their companies a huge advantage. Apple co-founder Steve Jobs, who has been all but sainted by Wall Street, famously said that "people don't know what they want until you show it to them." Jobs had an instinct for creating and designing products that people loved, such as the iPod and the iPhone, which was what drove Apple to unbelievable success. That ability is not unique to Jobs, however. Here are three other leaders who have a similar knack for reading the future. The CEO and co-founder of Netflix (NASDAQ:NFLX) has successfully guided his company through two major transformations, taking it from a DVD-by-mail provider, to a video-licensing streamer, to one that is increasingly betting on its own original programming. Today, Netflix is the largest video entertainment company by subscribers and is set to release more original programming that any other competitor this year. Reed Hastings recognized an opportunity early on that had been created by two recent inventions: the DVD and the Internet, which enabled discs to be ordered online and shipped to customers. Under Hastings, Netflix has been unafraid of disrupting itself, first with the transition to streaming, and later by moving to original programming. The CEO's comments on the future of the industry have also turned out to be surprisingly accurate. As Amazon.com (NASDAQ:AMZN) was building out its own Prime Instant Video service, Hastings predicted in 2012 that the company would eventually offer it on a standalone basis, saying, "We expect Amazon to continue to offer their video service as a free extra with Prime domestically but also to brand their video subscription offering as a stand-alone service at a price less than ours." Earlier this month, Amazon did just that, offering standalone streaming for $8.99 a month, $1 less than Netflix's standard price. Hastings called HBO its biggest rival in 2011, a claim that was mostly dismissed but has come true as the two have morphed into each other, with HBO launching streaming and Netflix developing original programming. While it's true that Netflix faces steep competition as it builds out a membership base around the world, Hastings has been studying the industry for 20 years and arguably knows better than anyone else where it's going. Like Netflix, Amazon.com Founder and CEO Jeff Bezos launched his company with a seemingly simple insight -- that no bookstore could carry the range of books a website could. Using the book business as leverage, Bezos expand into other categories where the company's lack of stores gave it an advantage, and Amazon has also recognized the potential of other nascent industries such as cloud computing and e-books, and it even followed Netflix into streaming, becoming a surprisingly strong force in the industry. Amazon's advantage in e-commerce has come from recognizing the opportunity early on and building out a network of warehouses that's unmatched by any other company. That has allowed the company to increase its delivery speed with programs such as Prime Now that offer one-hour delivery, as well as Prime's free two-day delivery. The company's latest experiment, Prime Air, which uses drones to deliver goods, is another example of the company's ability to harness new technologies in ways that others can't. That head start has made Amazon the dominant player in e-commerce, and it should continue driving sales growth. The Under Armour (NYSE:UAA) founder and CEO competes in a different business from Netflix and Amazon, but Kevin Plank also has an eye for where his industry is going. Under Armour keeps pushing the envelope in so-called wearable technology, with big acquisitions of fitness apps, and sees tech as the company's destiny. The company has an annual "Future Show," where it shows off new products and hosts an innovation challenge, which solicits product ideas and demonstrations from entrepreneurs who want to sell Under Armour its next big product. A winner at the first show was a magnetic zipper that can be zipped with just one hand, an innovation the company is in the process of incorporating into its product line. Under Armour's marketing similarly promises that the company's is working on the next big thing, whetting an appetite for the future. On the company's recent earnings call, Plank maintained his focus innovation, saying, "We're a different company than we were six months ago, and we'll be a different company in six months." Under Armour has also shown an instinct for signing talent, counting sponsorships with many athletes who are considered the highest-profile in their sport, such as Bryce Harper in baseball, Tom Brady and Cam Newton in football, Stephen Curry in basketball, and Jordan Spieth in golf. Arguably, the company has a better lineup of endorsements than even Nike, the leader in the sports-apparel industry. However, Plank's constant focus on innovation and technology is giving the Swoosh-maker its biggest challenge in a generation. 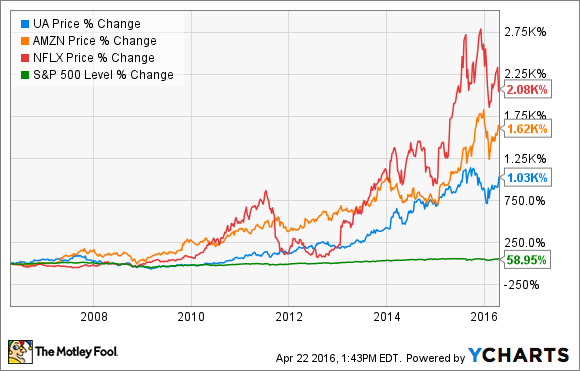 Unsurprisingly, all three of these stocks have trounced the market over the past decade. There's a clear reason why. All three are led by CEOs who are consistently innovating, have the ability to see where their industry is headed, and get there first. Hastings is the oldest of the bunch at 55, meaning all three leaders should continue at the helm for at least another decade. While 1,000% returns will be more difficult, the patterns we've seen in the past decade should lead to continued outperformance.